Coast Tigers is making there debut in this years Menehunes Invitational basketball tournament. They were once considered to be one of the upcoming Asian American basketball teams, however due to college they went there separate ways. However it seems like everyone is back to where they began and everyone is starting to pick up basketball once again. This team is very talented from there guards like Randy Lee and veteran Eric Nojima, to there combo guards/scorers Moses Lim and Samuel Thim. Coach Blake does a good job controlling these guys out there and they use the Nikkei Basketball Association (Mark Kimura's league) as a way to practice. They will be on of the exciting teams to watch in this year's tournament. The Pacers make there 2nd appearance in the Menehunes Invitational. They are hoping to make a better statement in this years tournament. Last year they struggled a bit. But after a year of training and maturing, Coach Andy Wing has them competing at a higher level once again. They made a strong attempt in LVI last year falling in the Championship game. This year they are looking more matured, bigger, smarter, and ready to compete for the Menehunes Invitational Championship. They also added more depth to there roster with some veterans. EVEREST is making there debut in this years Menehunes Invitational. Lead by Steve Tran he brings in players with high basketball IQ's. Floor generals John Chow and Tri Hoang, they have many years of experience in competitive Asian American Tournaments. Everest won the A Division for Mofufus Tournament this past year in dominance fashion. Everest also plays in local leagues around the area. Everest also has really clever big men on this team as well that can control the boards and tempo of the game. Look out for there inside out play as well. Tiger X-Treme is making there debut in this years Menehunes Invitational tournament. They are one of the younger teams, with a lot of youth and athleticism. They play in various tournaments, one being Tigers A+ Gold division. Team Manager Ellen Shimamoto does a great job keeping this team together, especially with there busy college schedules. If they stay together they will definitely be a team to reckon with once everyone reaches there prime age. Look out for this young and exciting bunch of guys out there! Arcadia Alumni is making there second appearance in the Menehunes Invitational. Arcadia Alumni played in various tournaments, VFW, LVI, Tigers, and plays in Mofufus leagues. They recently was 2nd place in the Tigers. Hon Trieu is the engine for this team while Big Ben Hwang controls the boards and dominates the paint. Look out for Paul Chen, Brandon Kwok, and Richard Tang shooting from behind the arc. Be on the lookout for "YU-insanity", will he be showing up to play of the weekend of the tournament? That could be a determinating factor of Arcadia Alumni success. 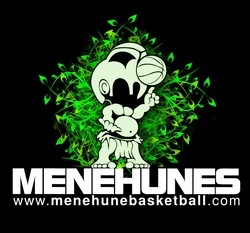 The Menehunes is hoping to have a better show in this years tournament. They recently won the Nikkei Basketball Association Tournament in the Silver division. They came in 3rd place in the Tigers Tournament this past year. They are hoping to make a better statement in this years tournament. Menehunes are lead by veterans Ryan Lee and Ray Hong. They have outside shooting as well as an inside presence with the ultimate veteran Allen Chen. Justin Kwok will be the enforcer in the paint. They have an exciting back court as well with a lot of combo guards like Victor Yen. Lets hope Menehunes can have a better tournament than they did last year. SATURDAY: A+ Division Games: 2-20minute Semistop quarters(stop on free-throws), last 15 seconds stop time for the first half, and last 2 minutes of the game for the 4th quarter will be full-stop time. (Clock does not stop on made baskets) 35 second shot-clock will be enforced. SUNDAY: Championship games ONLY will be SEMI-STOP. Full stop time the last 15 seconds of the first 3 quarters, and the last 2 minutes of the game. (Stop on EVERY whistle) (Clock does not stop on made baskets), 35 second shot clock will be upon request.